answer the following questions and submit them by 12th march. use of these cubes to create a show piece that can be displayed in your drawing room. Good job. For next assignment do some photography. Photography helps you think white Comparing a scene/ Picture. This will enable Toll to visually construct scenes creatively g Quickly. Take cue's from the Quick themes you have done in the Previous assignment for scene composition. submit atleast 15 photographs on depict themes by 4th march. let me know the time breakup you have used for drawing these sketches. 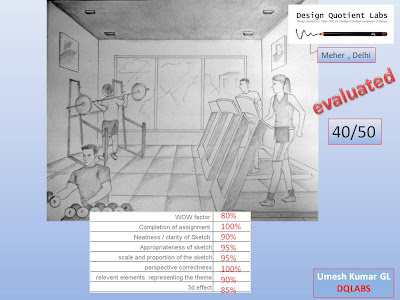 implement the feedback and submit hem by 24th Feb.
Give attention to proportion. You are doing good. if you want i can give you more themes for practice and continuee doing various different themes for practice. other wise you can choose to stop as your skills have come upto the expected level. let me know what you prefer. Visualise and sketch an Art class. submit the drawing by 29th Jan.
Update your theme sketch as per the feedback . Also draw a theme sketch on republic day parade. use one point perspective principles. 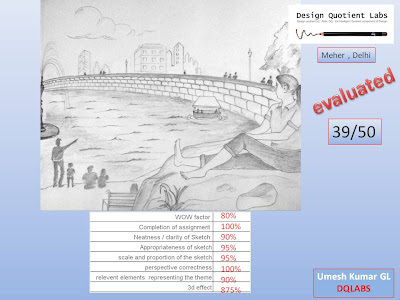 Submit both the sketches by 27th jan.
your color application and line quality have improved a lot. Keep up the good work. 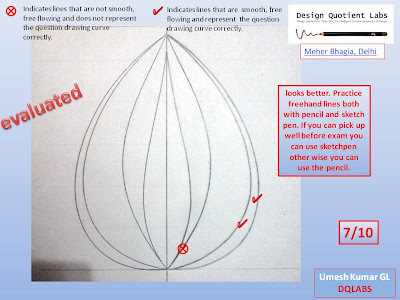 Now attempt the mocktest 4 drawing section and submit the same by 24th jan. stick to the time constrains. hope your questions are answered. fill in all hte balnks and submit htem by 22nd jan.
Good. 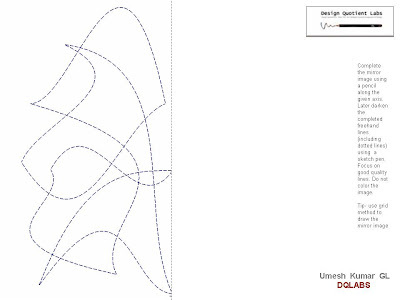 answer and submit mock test 3 drawing questions by 21st jan.
draw the outlines of the freehand drawing a little thicker. Good. now attempt mock test 2 both, freehand and theme sketching. stick to the time limit. 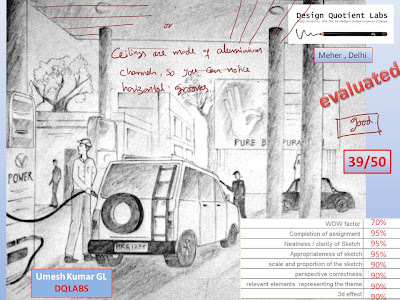 submit hte drawings by 15th jan. use all the concepts you have learnt till now and do a good job. 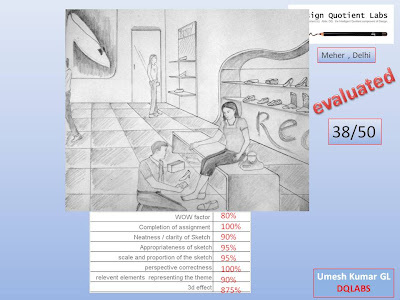 your drawings will be evaluated for 50 marks each. your strength is in drawing human figures. so i suggest you give more importance in drawing a number of them and make the scene busy and interesting. follow the time break up. 40 mins foreground includes time alloted for human beings and the environment. the people and environment inthe foreground shoule be vvery well detailed out. 20 mins for back ground also indiates the time for people at far and the environmentt. they need not be very well detailed. so plan your time smartly and sketch accordingly. as a next theme - draw grand parents and 3 children playing in a garden with 2 pups and a dog, infront of a villa over looking a valley. submit the drawing by 13th jan.
draw a theme of a construction site and submit the drawing by 9th jan. keep a check on the time. draw what all you can in 60 mins of time. good job. now using the one point perspective principles and the composition and shading concepts you have learnt draw a theme showing a college farewell party celebrations. draw all the relevant details along with human beings etc. make it a complete sketch. submit the drawing by 7th jan 2009.
i suggest you to read one point perspective chapter from the book and understand the concepts well. i will send you some drawings for one point perspective practice by email. 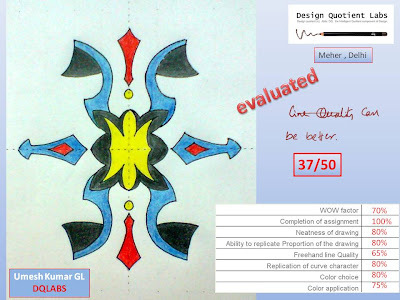 submit them by 31st dec.
implement the feedback and redo the sketch as shown in ideal composition. submit the assignmhent by 28th dec. Your coloring looks good. But not Stunning. Now you should work towards that. Conduct a google search on abstract paintings. select some Paintings you like the most. Compile them and submit by 23rd dec. umesh. answer the above questions. i shall send you assignments based on your answers. good job. keep practicing the freehand exercises daily. now lets move onto the coloring part. color the above freehand drawing exercises using 3 different mediums you are comfortable with - sketchpens, color pencils, crayons, water colors. use atleast 4 colors which coloring hte drawing. submit the assignment before 17th dec.
proportion and character of the lines and spaces are good. you need to work on line quality. i hope you are doing daily freehand practice. send me the latest freehand practice that you have done. alos redo the above exercise. submit this assignment by 12th dec.
i think you can do much better. 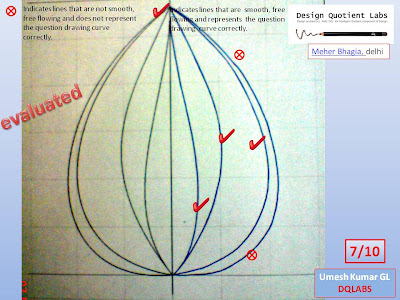 can you redo this assignment using a pencil instead of a sketch pen. 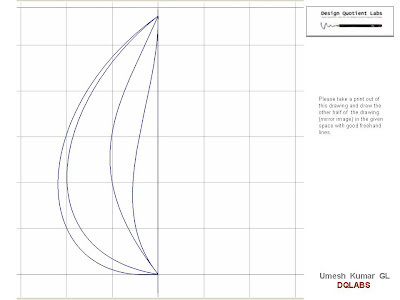 draw the final lines as dark as possible with the pencil (try using B/2B pencil) without compromising the line quality. submit the drawing by tommorow evening. complete all other freehand assignments in the book and submit them by 5th dec 2008.
try to draw the final line(presentation line) using a sketchpen. Lets start with toning up your freehand skills. PLease read the chapter on freehand drawing and attempt any 2 freehand drawing question given in the book. Note: For now focus on the proportion and freehand drawing part of the sketch only. coloring will be taken up separately. so you dont have to color the freehand drawing for these assignments till i ask you to do so.submit you drawing by 1st december. if it is not convinent please leave a message in the comment section below quoting the problem and expected date of submission that is convenient for you. I will submit my assignment on or before 3rd as I'm out of town. Sir, I sent you the redo assignment on 7th. I'm waiting for your evaluation so that i can take the next assignment. I did not keep the track of the time taken for coloring the individual drawings but overall I finished the three of them within 90 minutes. Yes, the first one is certainly the way you have opined...and that's perhaps because of not having used staedtler pencils with which I'm most comfortable cf. sketch pens and water colors. color the other freehand drawings (you have done before) using interesting combinations in 2 different mediums - steadler pencils and sketchpens. submit the assignments by 20 dec.
Sir, I took 1 hour to draw the skeleton sketch and I didn't take more than 30 minutes to add details and shade the sketch. I usually take more time to plan the sketch and to draw human figures in the foreground. Adding more details and shading is not a problem for me. ok. so lets focus on that problem. pick up some comic books, sketching books and couple of old inside-outside magazines. choose some 25 pictures / scenes of your interest and replicate(copy) the outlines of the objects in the sketch.do not shade. spend not more than 10 minute for each of these sketches. be quick and give attention to the composition, proportion and scale of different objects. do not use eraser. the purpose of this exercise is to get you accustom to quick generation of theme compositions. submit these by 29th evening. and during weekend if you are going out to a mall / a public place, take a digital camera along with you and click some interesting snaps, depecting some activity. take time to compose your frame in such a way that you follow the design principles suggested in the book. do these two assignments and submit them by 29th Feb.
Sir I am going to attend the NATA. I would like to know about the drawing test and preparations for it. sir,i m going 2 take up nata on 14th of june.i have some doubts regarding that.i will b thankful 2 u if u clear these doubts. 1)can v use sketch pens and scale for nata? 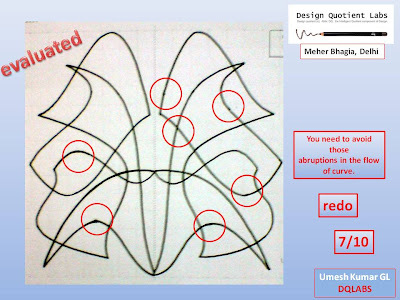 2)for questions in which they ve asked 'using circles,trianges and squares alone',shd v have 2 use ONLY those shapes or can v add some other designs/quotes 2 make the fig look more appealing?